Like princesses from a fairy tale, the Broderers of St Paul’s sit high up in a tower at the great cathedral stitching magnificent creations in their secret garret and, recently, Contributing Photographer Sarah Ainslie & I climbed up one hundred and forty-one steps to pay a visit upon these nimble-fingered needleworkers. 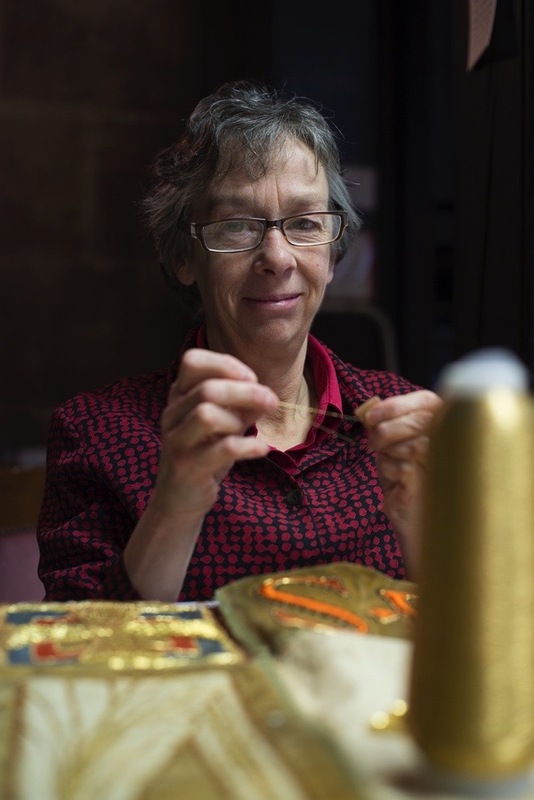 ‘There are fourteen of us, we chat, we tell stories and we eat chocolate,’ explained Anita Ferrero by way of modest introduction, as I stood dazzled by the glittering robes and fine embroidery. 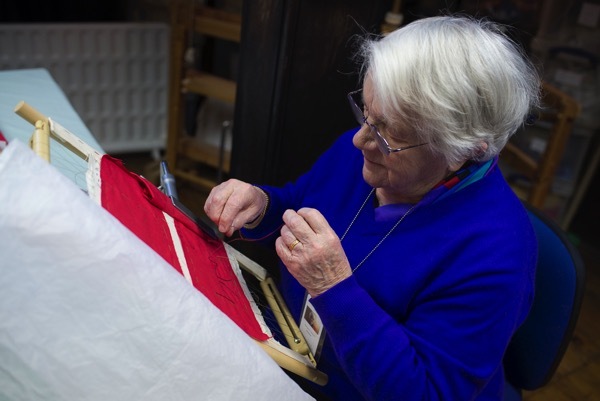 ‘It’s very intense work because the threads are very bright,’ she added tentatively, lest I should think the chocolate comment revealed undue levity. ‘We are all very expert but our eyesight is fading and a few of us are quite elderly,’ confided Anita, thinking out loud for the two of them as she picked up the story and exchanged a philosophical grin with Rachel. 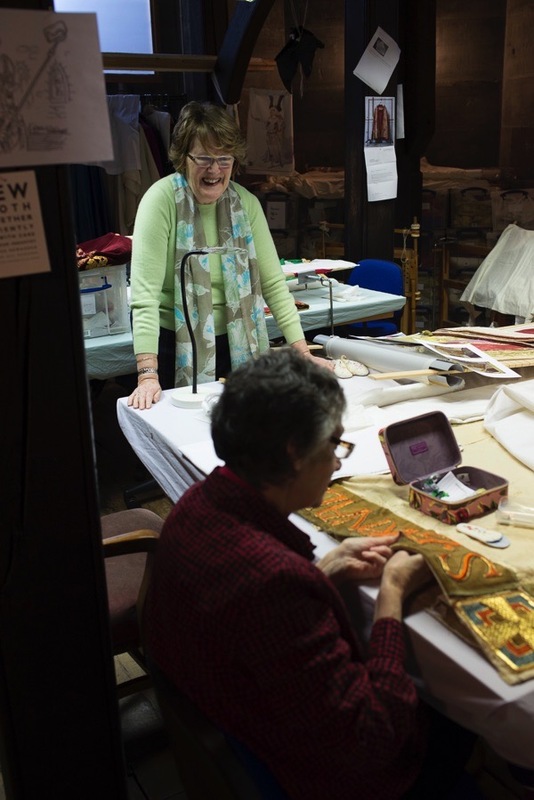 Nowhere in London have I visited a sanctum quite like the Broderers chamber or encountered such self-effacing creative talents. Gorgeous work. Well done ladies! What a fantastic thing to be able to achieve! Stunning work!! Stunning. I went up there recently on a visit with some fellow trainee Blue Badge guides and we were as amazed and enchanted as you were by the phenomenal work of these ladies who all VOLUNTEER their time. The skill is astonishing. 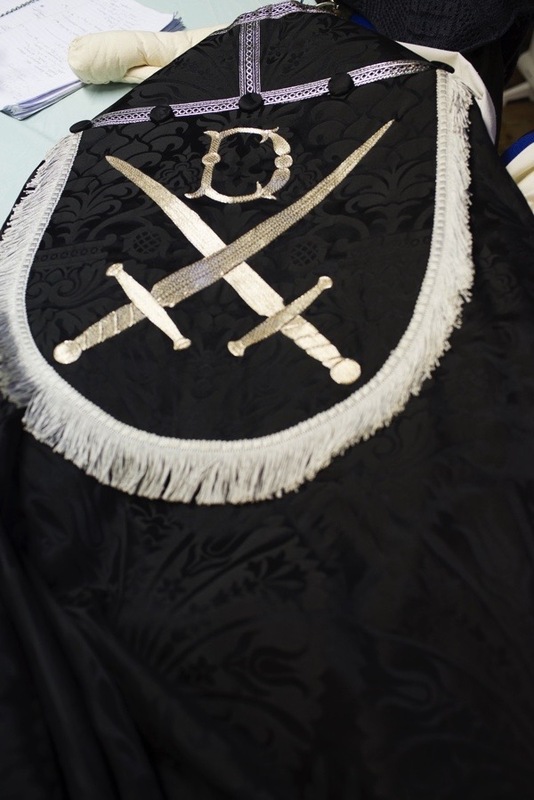 Queen Victoria’s diamond jubilee cope is there and was made for Mandell Creighton (his statue is in the South Aisle), Bishop of London, out of material intended for the Empress of Prussia’s Coronation. She was the eldest daughter of Queen Victoria. The Coronation never happened because her husband died. Great irony that the same fabric was worn for her mother’s own service. We also had a visit to the library – try and go – it smells of learning. The librarian calls it “Eau de B” for Bibliotheque. What a lovely story. 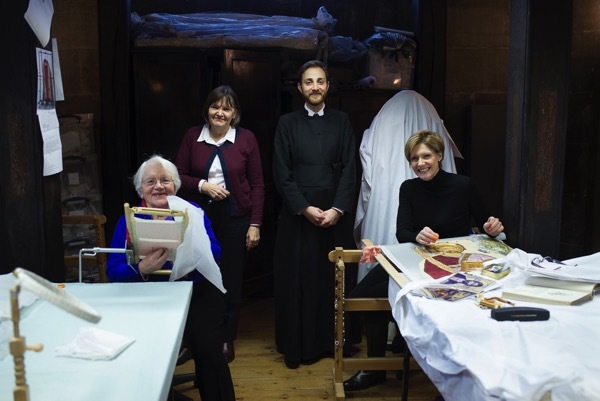 I once visited the Archive and Library which are also tucked away in the eves of St Pauls but I had no idea these talented women were also ‘squirreled’ up there! What an interesting article. Throughly enjoyed reading about these amazing ladies and seeing their beautiful work. 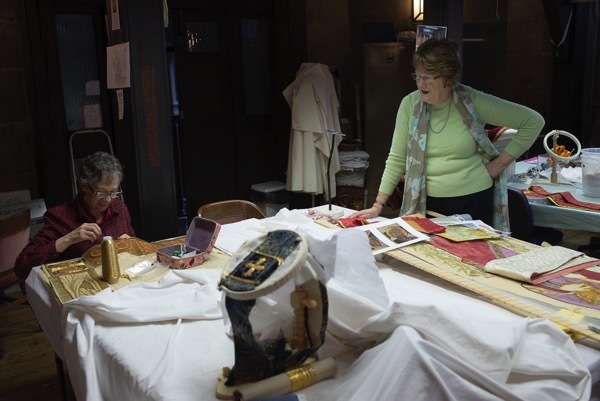 As Sacristan at St Mary’s Cathedral in Edinburgh, I was privileged last year to welcome some skilful members of The Edinburgh Embroiderers’ Guild who mended some of our vestments, including our two best copes and a Bishop’s mitre. 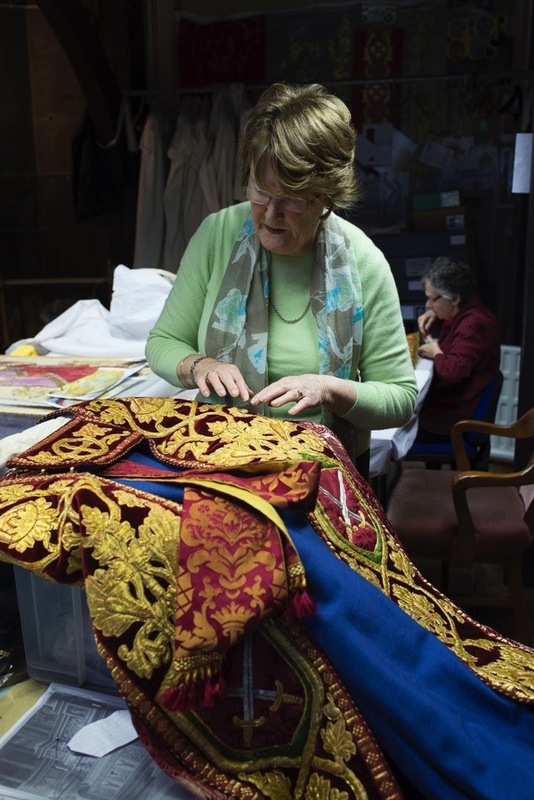 The work of St Paul’s Broderers is amazing! Thank you so much for a view behind the scenes. Charming story. I love these behind the scenes stories. 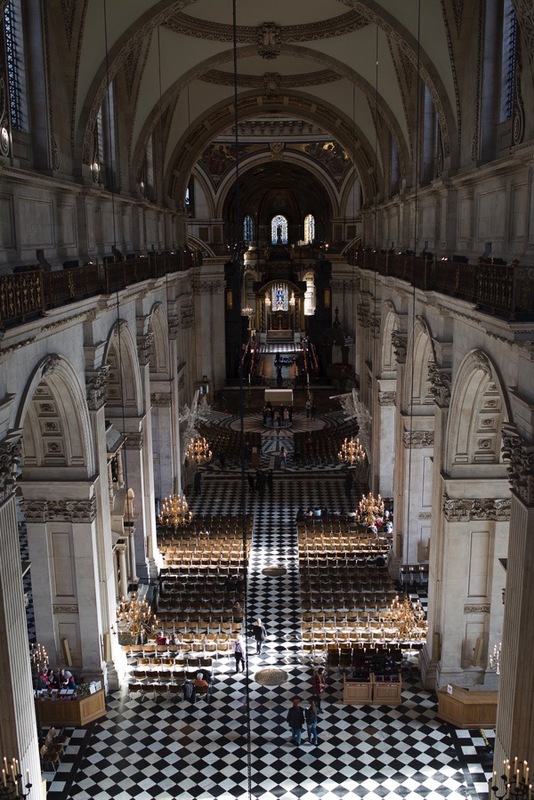 My husband designed and built church pipe organs so I arranged a visit to the organ loft for an evensong service in St Paul’s as a surprise on a trip to London. He loved it. I really admire these ladies as I can’t even sew on a button without there being blood!! Ladies at the Royal School of Needlework (if I remember correctly) embroidered a new Mother’s Union Banner, which I had designed for our village Mother’s Union several years ago now, and I still have the lovely copy of my drawing which they made, the Banner was beautiful but the little painting is also beautiful and I treasure it. What a lovely article. So much admiration for these women and their amazing skills. great post! lovely! and thanks. What a beautiful story. 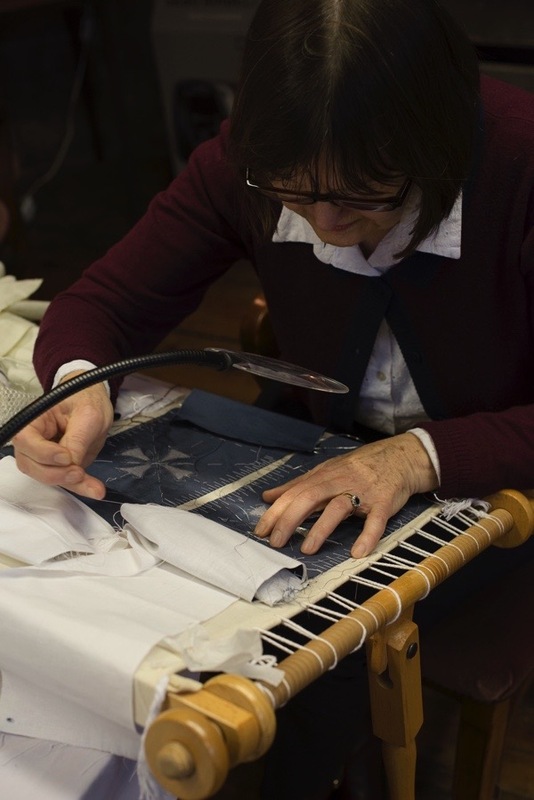 Those of us from the US who tour and have been lucky enough to have sung “How Great Thou Art” for British Cancer Research in the beautiful St. Paul’s have no idea how all of the beautiful handwork gets done or repaired. Thank you for your service to your country and to St. Paul’s. Do the High up ladys only look after the vestments of the Cathedral?? 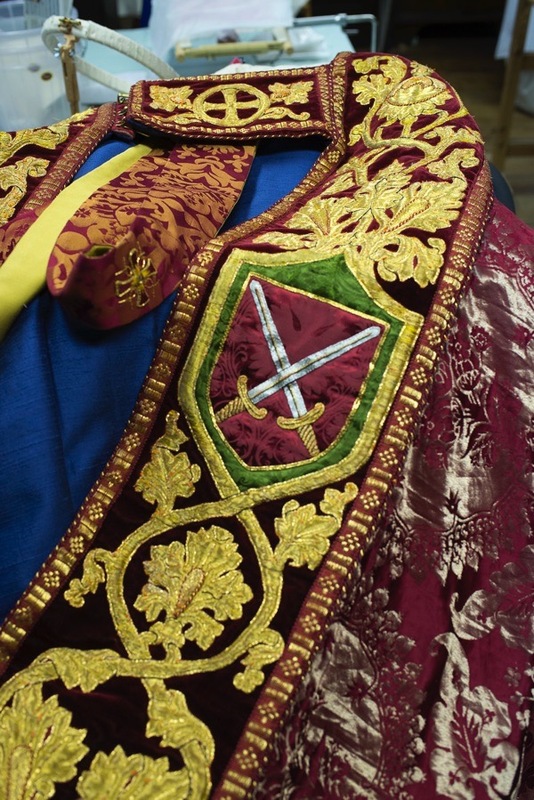 We at the Guards Chapel have a few vestments that need some, TLC. Beautiful work! 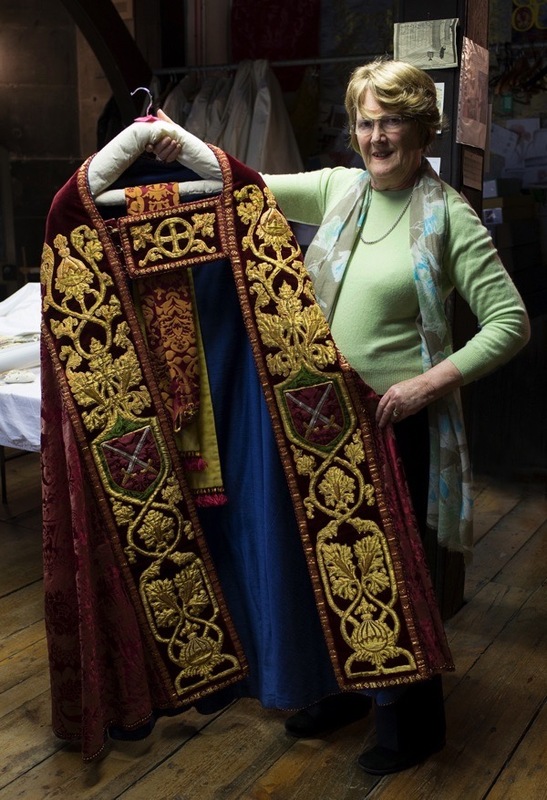 Warm greetings from the Linen Guild of St Paul’s Cathedral Wellington NZ. What a wonderful story!!! I love doing needlepoint and I agree that you can only have so many cushions. 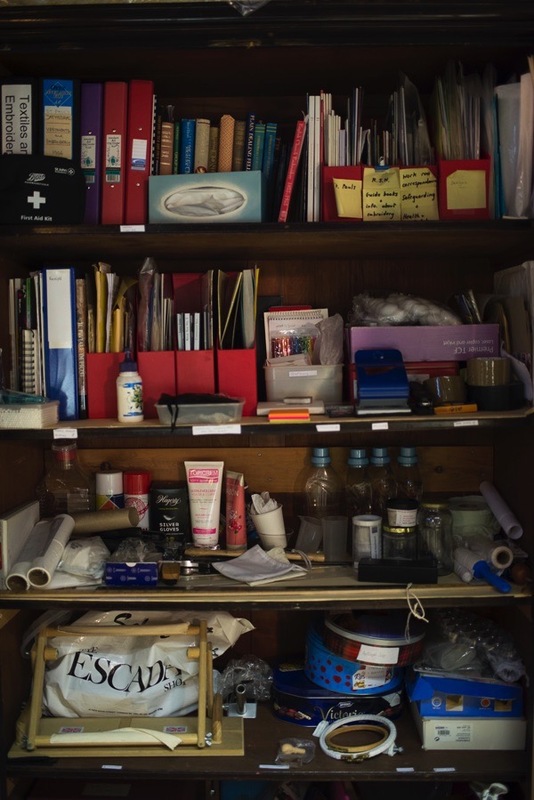 I have smany packed away in drawers! I live in Canada, but if I lived in London, this is certainly something that I would love to do! My daughter does live in London and one of my favourite things to do when I visit her is to go to Communion. Now I have another thing to see at St. Pauls!!! Thank you for letting us see the extraordinary women and their talents. What a wonderful treasure! Thanks to the volunteers who share their talents and provide priceless beauty for so many. Thank you for a wonderful story. I am a seamstress in a small parish about to begin a cope. I am inspired by these talented women! Thank you for this fascinating insight to the work that richly deserves to be more honored. They are artists in the truest sense. More pictures would have been appreciated! What a lovely report. 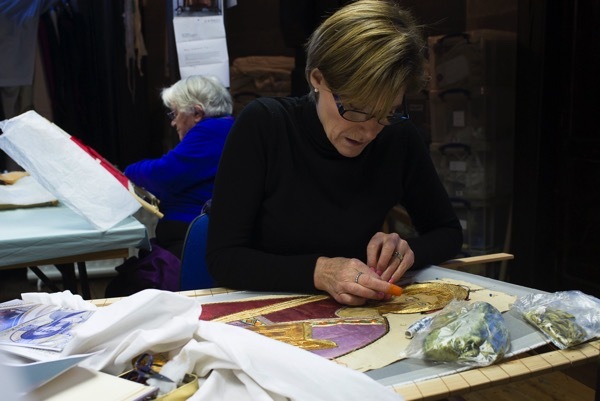 The skill and commitment of the embroiderers is wonderful. 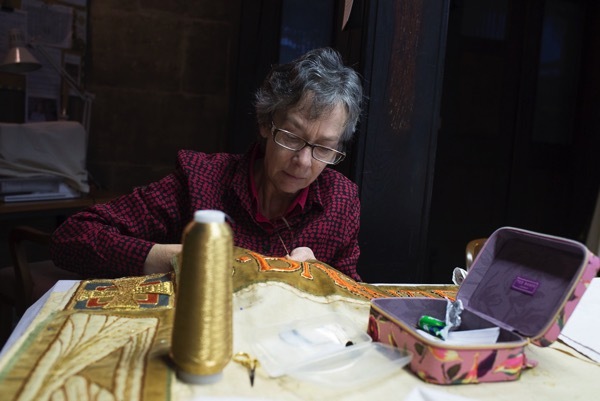 I wish my skills were half of those….I was recently in Turkey, and visitted where St Barnabus was martyred. I love the idea that his beard is being restored!